LifeJourney is organising an awards ceremony on the morning of May 30th at the Australian Centre for the Moving Picture (ACMI) in Melbourne’s Federation Square to commemorate the achievements of the Cyber Victoria Schools Challenge. The awards event will feature presentations by schools that participated in the challenge, a panel of speakers discussing issues related to building Victoria’s capabilities, and recognition of the leading schools undertaking cyber security in Victoria. Victorian schools and educators are encouraged attend the awards along with any industry, government, non-profit and higher education stakeholders committed to building the cyber security ecosystem in Victoria. 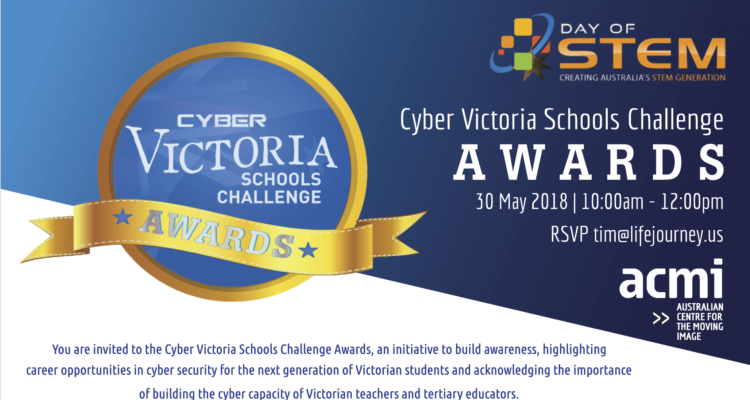 You are invited to the Cyber Victoria School Challenge Awards, an initiative to build awareness, highlighting careers opportunities in cybersecurity for the next generation of Victorian students and acknowledging the importance of building the cyber capacity of Victorian teachers and tertiary educators.